Our Economy Banner Stand is the perfect thing to give each of your sales reps for doing local trade shows, trunk shows, and events. They retract into a cannister that is about the size of a baseball bat. When the time comes to show them, three poles come out of the case and stack into a hole in the back of the unit. The banner has an aluminum rail on the top that hangs off the pole. Done! We see banner stands like this being used all over- in stores, airports, town halls, at concerts, even police stations. One of the best things about them is that they do not need any fixturing, and you can move them around if you need to. It’s a lot harder to do that with a poster or banner. 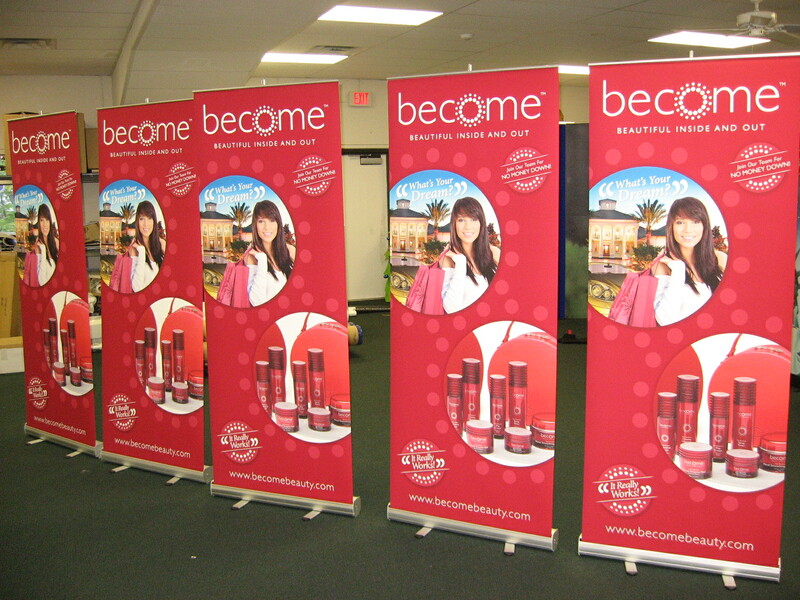 This entry was posted in Banner Stands and tagged economy banner stand, retractable banner stands, roll up banners. Bookmark the permalink.